Do any of you use a portable camping oven? If so what type and what is your experience. We do not have an oven in our MH as we have really never used one in the past but plan an extended trip next year to Alaska and I would like a little more freedom with my cooking. Cakes, cookies, pies for Santa. I have used an electric roaster a lot. If you want to go through the PITA of storing and moving it around you can not beat a CampChef although it's still on the small side. It can easily be adapted to use an RV's low pressure propane port. We used ours a lot until I just was tired of hauling it around. Our last trailer had no oven either. The new Roo has one that is ok for the occasional biscuit or two, which is about all you can fit in it. One can cook anything in them with a little practice, alloy ones are lighter they come in a smaller size for two. All you need is a fire or some charcoal and time to learn. That is the thing that brings smiles here. We have an over in the 5er.Yet my wife has a toaster over, dutch oven, cookie sheets, cake pans, plus more pots and pans than some restaurants. We had to get 'made in the USA' cast iron in Gatlinburg. We do not use much of it as we eat out a lot! I made one in scouts using a cardboard box, aluminum foil, coat hangers, and charcoal. It workedl, but a dutch oven is much better. 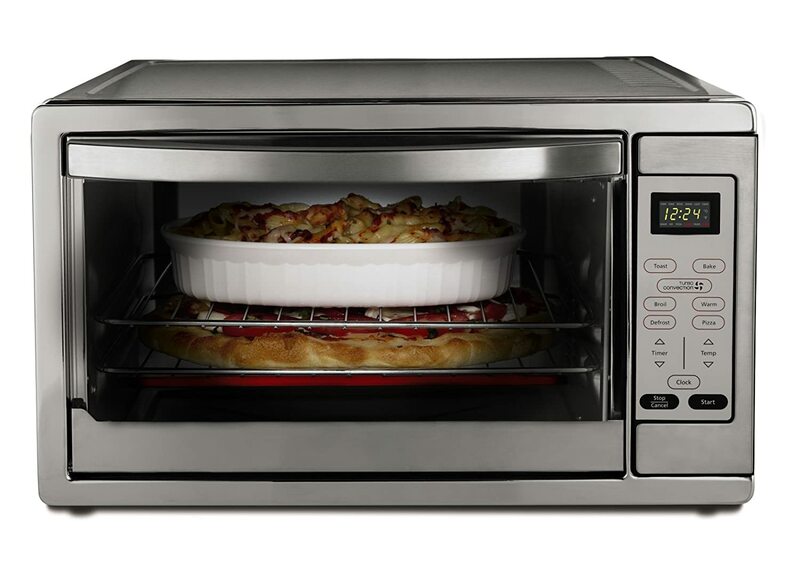 When I first seen it I thought it was a microwave but it is a regular oven. Worked wonderfully outdoors for baking pies and cakes. Been using Dutch ovens for many years. We make or buy a pie and place it in an 12"Dutch, and coals to match the temperature required and cook away. Any thing meats, sides, desserts can not beat them. My experience with the ovens has been poor when using in a kitchen. I didnt do it with this brand but they usually burn or had poor temp control and never lasted very long. I Love dutch ovens. Very easy. If you don't want to use coals many things can be done on the burner but lid gets cold so you have to pull and reheat often for longer cooks. I have an oven in the trailer and carry one of these anyway. I did turkeys in cardboard boxes lined with foil for scout thanksgiving cookout. If you use pie tins for the coals and bricks or soda cans with sand to hold the grates you just swap coals every 30-45min. Way better than hauling around another big appliance. I just cut a small slot on bottom of the box to access coals. . Doesn't your rig have an oven? I have also used turkey ovens. These are cheap ($30) and can cook a lot more than turkey. It really depends on what you want to cook amd what you are willing to store for the money to me. I have several and love to use them. We also have a Camp Chef, a bit bulky but does the job well. We mainly use it when there is a restriction on campfires due to drought. I can cook anything in a dutch oven that you can cook in a regular oven, and I will guarantee it will taste better! My preferred brand of Dutch Oven is Lodge, but there are others out there. Look in thrift stores and yard sales for them. They literally last forever. A camp dutch oven has legs and a lip on the lid.